Add the finishing touches to your bridal ensemble with the help of The Knot Shop's bridal hair veils, bridal floral hair accessories, headbands and more! Flaunt your sense of style with our large selection of bridal hair veils and bridal hair accessory options that will add an even more beautiful touch to your wedding and wedding ceremony. Our bridal hair veils and bridal hair accessories are available in an assortment of fabrics - choose from chiffon, tulle and satin. Finishing touches are created with lovely details that include romantic pearls, sparkling crystals, feathers and delicate flowers. From dramatic floor-length bridal veil options to seductive bird cage styles, our many styles and designs are available at amazing prices that will delight you!Our bridal hair accessories will add romance to your wedding dress. For the romantic at heart, choose our lovely Single White Fantasy Bloom or our Single Champagne Fantasy Bloom bridal floral hair accessories to add to our White Satin Wrapped Headband. These single floral decorations are stunningly beautiful and are intricately created. 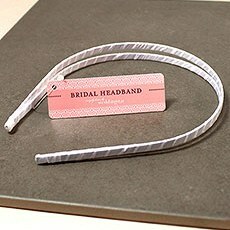 Prefer a DIY veil or hair piece? You may want to purchase our White Satin Wrapped Headband and create your own personalized bridal hair veil.For vintage-inspired weddings, our Vintage Wedding Bird Cage Veil will fit the bill. Sculpt the lovely French netting just the way you want it - add jewels, flowers and more for a uniquely special look that is guaranteed to turn heads. Add our Feather and Chiffon Floral Wedding Hair Accessory for a dramatic statement.Wedding veils are as romantically timeless as the wedding itself - find the bridal wedding veil that is perfect for you with our selection of stunning veils. These veils can be worn in a variety of styles to emphasize drama, romance or fun. Single or double borders are available, as are one or two tiers. 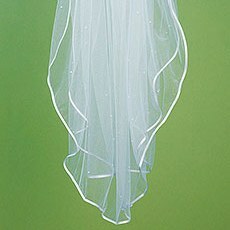 Our sophisticated 2-Tier Standard Tulle Floor-Length Veil is the veil you have dreamed of since you were a little girl. Amazing details such as crystals, pearls and satin edging demonstrate the quality of these wedding veils, and you are guaranteed to not be disappointed in your purchase!Adorn your hair with these gorgeous bridal hair accessories and bridal wedding veil options from The Knot Shop - you are sure to find the one that fits your style, motif and preference!